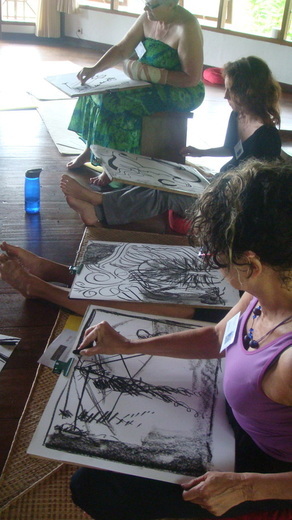 Participants will develop hands-on skills in drawing and painting, with Balinese culture and aesthetics and natural flora and fauna as primary sources of inspiration. Strategies for creating original art will be explored and theoretical underpinnings of these strategies will be introduced and tested in practice. Participants will gain deep insights into Balinese history, culture, religion, traditions and way of life within the context of Asian cultures and peoples. Topics include language, the importance of family and traditions, Balinese names, the cast system, cremation, magic and superstitions. No past art training or special talent is required for this workshop. To develop the skills and confidence to express ones’ thoughts and feelings through the visual arts, inspired by Bali’s rich and unique culture, traditions and aesthetics. To deepen understanding of Balinese culture and history, with particular emphasis on religious beliefs and aesthetic concepts. To gain insights into the impact of modernity, tourism and current social and political realities on the Balinese way of life in today’s world. To appreciate Bali’s unique position within the context of South East Asia, culturally, historically, and aesthetically. (Bruce Sherratt and Dr Vivek Bammi). Group discussions, analysis and appraisals will be an important and recurrent feature of the workshop. The impact of recent developments in brain research on understanding drawing and the creative process will feature throughout the workshop and will underpin all practical studio art projects. Participants will be introduced to the geography and mentality of Bali Aga and pre-history. We move to consider Balinese Hinduism and religious concepts and the epics Ramayana and Mahabharata. There will be a series of field trips to important venues relevant to the workshop, e.g., Puri Anyar Kerambitan, and evening dance/ritual performances, such as the Kecak & Fire and Trance ritual. Evaluation Participants will be required to submit a minimum 4-page digital portfolio within 14 days after completion of the workshop. The portfolio should combine digital photographs of artwork produced and other photographs taken by the candidate to illustrate the written material. Written notes should accompany the digital photographs of candidates’ own artwork indicating, e.g., title, media and techniques (where applicable), and evaluation/appraisal of the included samples. Candidates should establish perceived links between the two primary elements of the workshop: Visual Arts and Balinese Culture. They will also be asked to consider how the workshop has benefited them personally and professionally, and how the experiences and knowledge gained will beneficially impact their professional practices. Participants should identify features of the workshop they found to be most significant and instructive for them personally, ending with conclusions arising from the workshop and topics the participants find worthy of further investigation. Bruce Sherratt and Dr Vivek Bammi will liaise to award final grades. Participants apply directly to SUNY-Buffalo to register for the 3 credits.